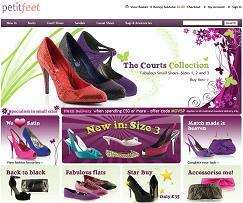 Petit Feet is a specialist store that offers a wide gamut of small size footwear for petite women. The store's large variety of shoes, sandals and boots in sizes one, two and three offer your petite feet a perfect fit. Their footwear including formal shoes, casual shoes and elegant heels for special occasions are a conflation of panache and comfort. They stock footwear from brands like Dolcis, Belle and Mimi and Hush Puppies to name a few. Besides footwear, they also stock a good range of accessories in sizes that suit a petite frame. You will find day bags, evening bags and bags that complement your attire. You can also pick up some quality shoe care products at Petit Feet. The official Petit Feet website features information about these wonderful products. Currently, the most exciting styles available at Petit Feet are the dramatic court shoes with varied heel heights from Dolcis. Available in sizes 1, 2 and 3 in different styles, these shoes are ideal for office and dance floors. New arrivals also include sleek wedge shoes and snug flat shoe varieties from Rocket Dog, comfy leather trainer shoes from Skechers and sultry leather wedge and leather mule shoes from Dolcis. Other blazing arrivals are the glamorous jewel studded T Bar suede sandals from Belle and Mimi and a host of exquisite satin clutch bags from Dolcis to hold your essentials. Find information about these freshly launched striking footwear and accessories by visiting Petit Feet ‘New In’. Patent Shoulder Bag With Croc Effect. Medium heel Dolcis satin sandal with knot trim. Get 10% off all orders at Petit Feet with voucher code OCT10PF (entered on the payment page of the checkout). This offer is valid until 31st October. The Delivery time is 9am-6pm. Delivery at an alternative address other than billing address is possible only if it is in UK.